At the recently held MUSIGA Grand Ball, on the 29th December 2017 at the State Banquette Hall, the special guest of honor, His Excellency Nana Addo Dankwah Akufo Addo revealed to the patrons the names of some Ghanaian musicians he loves and listens to their songs. President Nana Addo revealed that besides the hectic business of running the country, he enjoys listening to songs of legendary musicians such as Daddy Lumba, C.K Man, Amakye Dede, Paapa Yankson, Gyedu Blay Ambulley. The 73-year-old president of Ghana also stated he enjoy songs of contemporary musicians such as Shatta Wale, Sarkodie, Stonebwoy, Samini, Becca, Edem, D-black. 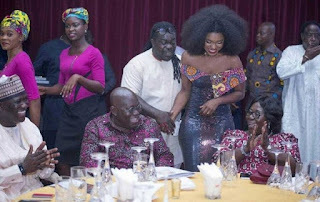 Nana Addo added that the young ones who have just entered the industry like Kuame Eugene, Ebony, Kidi, and Fancy Gadam have also caught his attention. Not long ago, Nana Addo invited Shatta Wale to the Flagstaff and honored him with a Key to the nation.